The Mayor of Winchester, Cllr David McLean, joined the Bishop’s Waltham community to celebrate the launch of the new, super-sized Elliotts branch on Wednesday 28th June 2017. The ribbon was cut in true builders’ style by Managing Director, Tom Elliott, Branch Manager, Rob Norris and The Mayor of Winchester using a bolt cutter, hedge trimmers and a chainsaw. After taking a tour of the extensive site of building materials for the trade and public, the Mayor of Winchester spent time chatting to staff and customers. In his speech, the Mayor praised Elliotts for being forward-thinking. Trading for over 60 years, the Bishop’s Waltham branch is the oldest in the Elliotts network and has now tripled in size thanks to a well-deserved re-build. The new, modern branch, open to both trade and public, now carries a larger range of building materials. Customers and the surrounding community were all invited to explore the super-sized branch and celebrate with staff. 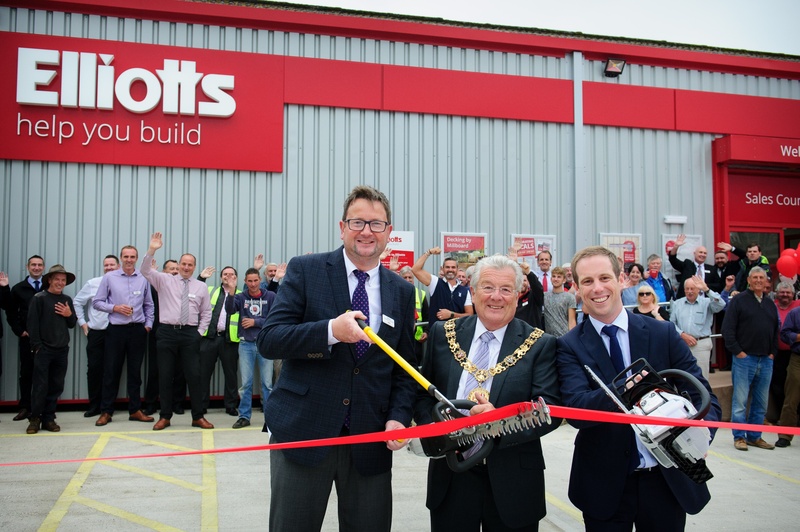 Rob Norris, Branch Manager of the Elliotts Bishop’s Waltham branch, said, “The new facilities are quite a transformation and access is now much easier. You can find our Bishop's Waltham branch here.